Hi friends, and to all the Moms out there, a Happy Mothers Day! I am blessed to be the Mom to three amazing adult children, and look forward to spending the day with two of them. One of them lives out of state, but I'm super excited that I am going to visit him at the end of the month. 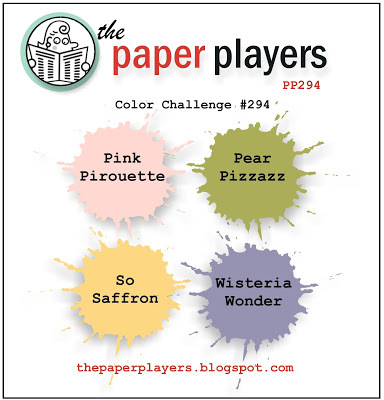 Jaydee is our hostess with the mostess today at The Paper Players, and she has a wonderful pastel color combo for us. It will come as no surprise to you that I immediately thought to do something floral! This is the first time I'm inking up my new Organic Blooms stamp set from Mama Elephant, and I am in love! This is such a beautiful bouquet and I can't wait to use it with other mediums. Today I inked it up with Versamark Ink and embossed with white embossing powder, then watercolored the image using ink refills in the challenge colors. I embossed the sentiment and banner onto vellum, and I have a little trick to share. Though not on my supply list, I used Elmers Spray Adhesive to attach the vellum to the card base. It works great and since it's a super fine mist you can't see it through the vellum. I've had the frame of my card laying around for ages, and when I saw the sketch at Freshly Made Sketches I knew it was the perfect time to put it to use. 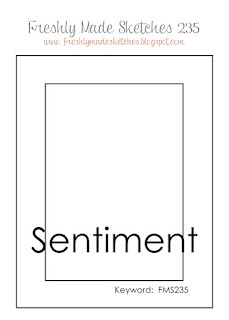 This stamp set comes with lots of great sentiments, but I used one from a different set to stay closer to the sketch. 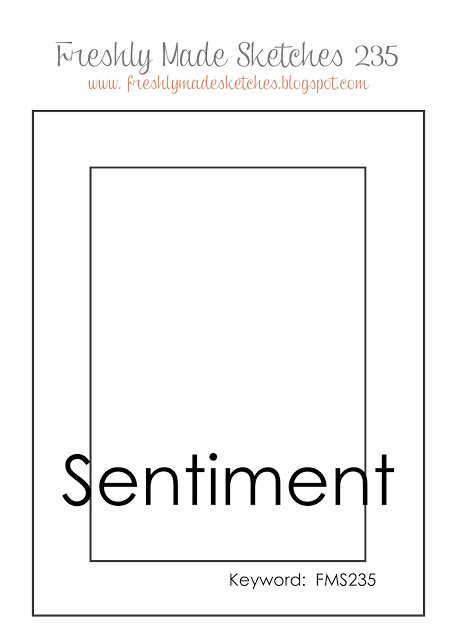 Believe it or not, I didn't have an appropriate sentiment big enough to extend accross the entire card. I'll have to do something about that! Thank for stopping by, and please visit the rest of the Design Team at The Paper Players! We hope you'll play along with our challenge this week, too! Simply gorgeous!! Love your watercolor! It makes the flowers look so realistic! Happy Mother's Day to you, too! Hi Sandy, I love this card, and the sentiment is great. Was the spray adhesive hard to do? Like too much or not enough? Hope you had a great Mothers Day. After seeing how gorgeous this is, I need to try this technique!I like how you framed it too. Awesome Sandy! What an amazing floral background! I love how you used the stitched border to frame it. And thanks for the tip about the Elmers Spray Adhesive and the vellum. I've got "special" tape for use with vellum but it's really not all that special so I'dd love to try something better. WOW!!! This absolutely gorgeous!!! The colors go amazingly with those beautiful flowers! Gorgeous card, Sandy! With such beautiful watercolors, it's a piece of art. Gorgeous blend of the challenge colors, use of the sketch and what a clever tip for vellum! Fanstastic idea! Absolutely gorgeous! Those flowers are amazing - so soft and pretty! Thanks for joining us at FMS this week! Beautiful, Sandy! Great watercoloring and I love the vellum banner at the bottom. Your watercoloured florals are so pretty Sandy - I love the addition of the sprinkles too!